be turned over to him. keep his promise to sell the land. Don Sebastian Montoya repudiates his promise to sell a small village on his land to tenants after Vaquero obtains the purchase money. Story Line: Vaquero received the money from a dying friend to buy the village. This matter becomes complicated when he learns the money may have been stolen by his friend and bandit, Miguel Morales. Character Highlights: One of the strongest episodes for Vaquero with background information on him about his native village, Casa Cuerva. There is a lot of interaction among all three of the Montoyas - Don Sebastian, Mano, and Victoria. This episode shows throughout how differently John Cannon and Don Sebastian do business and how frustrating it can be for each of them to work with and appreciate the other. 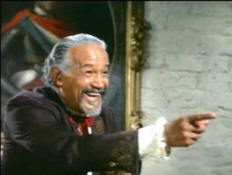 Don Sebastian to Mano, "Poor Victoria, what kind of a life will she lead being married to an hombre who is honest?" Mano sarcastically to Don Sebastian, "Papa, before I too begin to cry I must go join the cows." Mano demonstrates his mediation skills - between his father and John, as well as between his father and his sister. Good supporting performances from John, Buck, and Blue. While Buck and Sam are rounding up strays, a stranger comes stumbling through the desert, wounded and possibly dying. Finding him on their way back to camp, Buck sends Sam for a wagon, but not before they search the man for some form of identification and find, not his name, but a money belt with several thousand dollars in greenbacks. Back at the ranch, though, Vaquero recognizes the man. His name is Innocente, a man from Vaquero's own home village of Casa Cuerva, back on Rancho Montoya. dollars on the wounded peon. 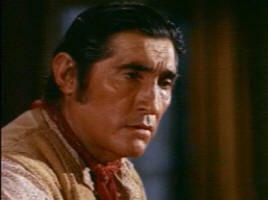 Vaquero hears Innocente's dying words. 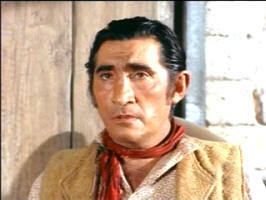 Innocente tells Vaquero that the money is for the village, to buy the land for their town from Don Sebastian, as the old Lion has promised them they may. 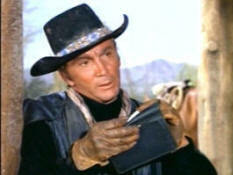 Then he dies, leaving the money with Vaquero to deliver to the people of the town. 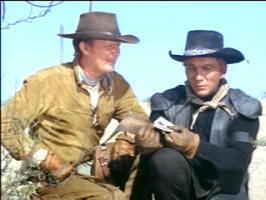 Vaquero tells Buck about the task Innocente has left him, but Buck has other concerns. The bullet they removed from Innocente's body was from a hand gun - and both men know the Apache never used pistols, only rifles. Buck and Vaquero both realize now that the person who shot Innocente could not have been an Apache. Later that evening, Blue rides in with word from Big John, who is at Rancho Montoya trying to negotiate with Don Sebastian. Big John wants Blue to bring a crew to Rancho Montoya, but he wants Buck to stay behind to look after the ranch. Buck suggests that Vaquero ride down with them, as it will be a lot safer for him, carrying all that money. Down at Rancho Montoya, things are not going as well as they could. John is trying to convince Don Sebastian to sell to him at cost, because John has committed himself to a "no-profit" deal with the army to supply beef for the Apache reservation, and he needs the cattle to fill out his own herd. 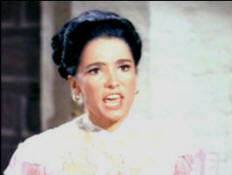 Don Sebastian is playing his usual games, and Victoria, caught between her father and her husband, is furious. Victoria is furious with her father's manipulations. 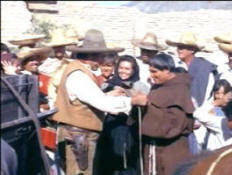 Vaquero gives Father Rufino and the villagers the money from Innocente. Manolito, however, has figured out why his father is giving John such a hard time; the old Lion is waiting for word from his cattle agent. He expects a market in hides and tallow to force the price up, and does not want to commit himself to Cannon until he knows for sure. Though Manolito tries to tell his father that the market does not exist, he is basing his belief on what he heard in the cantina, a source Don Sebastian will not accept, and the two part uneasily. In the mean time, Vaquero has reached his village with the money for the land Don Sebastian has promised. The villagers are ecstatic, until they learn that Innocente has died trying to bring the money to them, and they file into church to pray for his soul. Buck is suspicious of Munn's credentials. Back at the High Chaparral, Buck has his own problems, He's been confronted by a stage agent named Frank Munn, who claims that the money Innocente was carrying was actually stolen from a stage passenger, and he has been sent to recover it. Munn presses Buck for information. 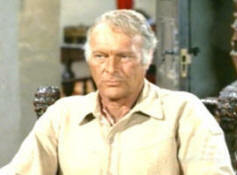 Buck does not like Munn, considering him little more than a bounty hunter, but he has trouble denying the validity of Munn's claim, especially when Munn explains that he was the one who shot Innocente. 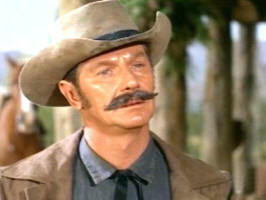 Buck has little choice but to bring Munn to Rancho Montoya. At Rancho Montoya, Don Sebastian has confirmed that Manolito's rumor was correct and has agreed to sell to John at the price John is asking. Cannon is pleased, and Don Sebastian is also, since he believes he is actually now charging John more than he could get for the cattle anywhere else. 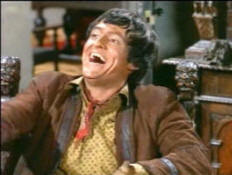 Don Sebastian is shocked to find out that John Cannon knows all about it - that Manolito told him after all. What will happen to his daughter, he worries, married to an honest man? though he knows he could now get more. John in the cattle deal. While Manolito has the last laugh on his father, Blue comes to tell Big John that the Chaparral hands are all passed out drunk. 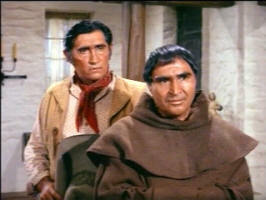 As he leaves the house to go deal with the situation, Vaquero comes in with the village priest to talk to Don Sebastian. Mano, letting his father know he has done no such thing. Taken by surprise - he never expected them to be able to raise the money - the old Lion reneges on the agreement. 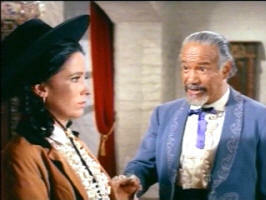 Vaquero and the priest are deeply disappointed, but this is Don Sebastian, after all, and they acquiesce. For Victoria, however, her father's cruelty is the last straw and she vows to leave the rancho and never return. 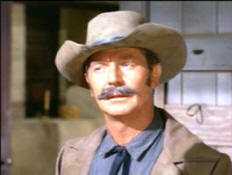 As John tries to pull his sobering, and now chagrined, crew together, Buck rides into Vaquero's village with Munn. He tells Vaquero what Munn claims, but Vaquero refuses to believe him and refuses to turn over the money - seeing it as his people's only hope. John refuses to force him, saying that they will leave it to a court-of-law to decide. John then goes off to get his cattle, with Buck electing to stay behind to be sure there isn't any trouble over the money. Trouble comes, though, and soon, in the form of the Morales gang with whom Innocente was supposed to be riding. They, too, have come for the money. A ferocious gun battle ensues, in which Buck, Blue and Vaquero are hopelessly outnumbered. Vaquero refuses to turn over the money. Buck encourages Miguel to spill the beans. Miguel Morales sets fire to the village, and as Blue escapes through the roof of the cantina to try to get behind their captors, Vaquero comes to the decision that the money is not worth their lives, and throws it out the window. John arrives, driving the cattle through the middle of the gun battle, as Innocente's money blows away. A water brigade is formed to stop the fires, and the extra help from the Cannon men soon overcomes the Morales gang. There is still the question of what to do with what is left of the money. Buck manages to choke the truth out of Miguel Morales - that the theft was an inside job. The money really did belong to Innocente, and Munn, himself, had set that stage up. The villagers take Munn off to their own variety of justice, and the padre gathers up what money he can - half of the original sum totaling $2500. Back at the rancho, Don Sebastian is heartbroken that Victoria is serious about leaving him forever. His conniving ways have finally cost him more than he can bear to lose. Manolito, however, offers to come to his father's rescue; if the old Lion will agree to sell the land for, say, half of what was originally offered, Manolito is sure that Victoria will forgive her father. Victoria is eager to forgive him. Don Sebastian, seeing an out, and believing that the villagers could never raise that much money, agrees, giving them 24 hours to do so. But again, Manolito has the last laugh, Vaquero and the padre come in with the $2500, Victoria is delighted to forgive her father, and Don Sebastian, knowing he has been fairly beaten, acquiesces with good grace.